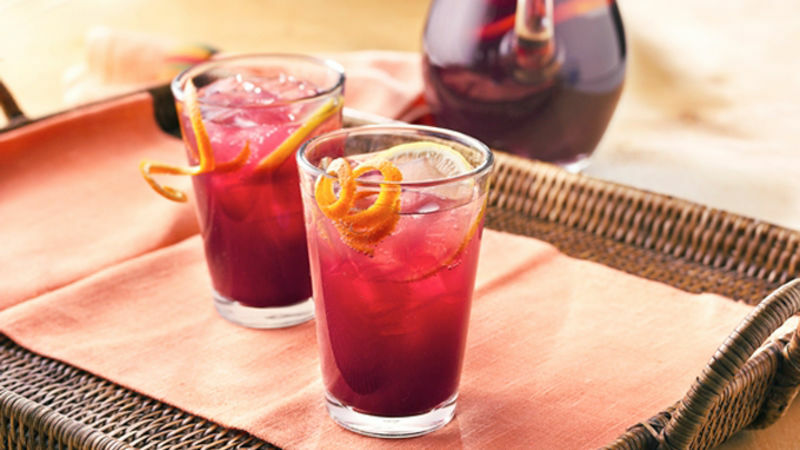 One of the easiest, tastiest party beverages is sangria. What Is Sangria? Sangria is a chilled mixture of wine and fruit that originated in Spain. In addition to being simple to make, sangria is a highly cost-effective way to serve wine, because the fruit and ice help to stretch the drink farther. Plus, it tastes great even with cheap vino—you can use just about any variety. It’s also great when paired up with a yummy salsa or dip. Here are five quick, scrumptious and inexpensive sangria recipes that are sure to make your next party a hit. Basic Sangria: This basic sangria the classic of all sangrias, and about as easy as it gets. Bottle of red wine combined with lemon, orange and a tart apple. Throw it all into a large pitcher and stash in the fridge for at least 1 hour. Perfect with chips and salsa or guacamole. White Sangria: Not everyone is a red wine drinker, so here's a lighter version that simply substitutes the red for white to make a white wine sangria. It's a little bit lighter, but just as delicious. Also great with chips, but why not change up the salsa too? The watermelon salsa is a sweet and spicy alternative. White Sangria Spritzer: If you want to make your white sangria a little fancier, trading the regular white for a bottle of sparkling white wine, Champagne or Prosecco is definitely worth the try. The white sangria spritzer also gets its slightly different taste by adding some pineapple into the fruit mix. If you want to double your pineapple fun, this is a great one to serve with pineapple salsa. It taste great on almost any grilled meat. Pomegranate-Mint Sangria: If you're looking for a bit of a cocktail adventure, this pomegranate-mint sangria may be right up your alley. Pomegranate seeds combined with the refreshing taste of mint makes this a taste sensation you won't forget any time soon. Keep the adventure going by pairing this up with a guacamole layered dip recipe and some skinny tortilla chips. Blueberry-Ginger Sangria: This blueberry-ginger sangria is really fun and is a different way to bring a little bubbly to your cocktail. Blueberries and ginger ale play great together in this really unique sangria. Pairing? A jalapeño popper dip could be a nice little extra kick!